That's Peachy | Award Winning North East UK Fashion, Lifestyle, Beauty Blog: My Favourite Nail Polish Ever! My Favourite Nail Polish Ever! I have lots of nail polishes, and my collection is forever growing. I just can't resist buying new bottles and adding to my rainbow of colours which I have already accumulated. I have one polish, which has been my firm favourite since I bought it, but just recently, I discovered a new way of wearing it, so I thought I would share it with you! 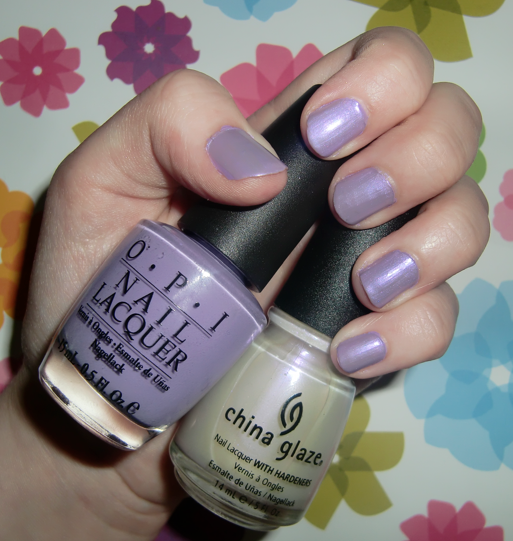 The nail polish I am talking about, is OPI 'Do You Lilac It'. I bought this about a year ago, from eBay, and it was my first OPI. I was very impressed, and definitely think they are worth the price tag! They apply smoothly, dry quickly, and I have found that I only usually require one coat to get the full colour pay off. It is quite a dark lilac colour, but I just think it's stunning, and I would guess that it would suit almost every skin colour. I find it really wearable, and use it for day and night... I just can't get enough! The pictures above are without flash (left) and with flash (right). Both with just the one coat of polish... beautiful isn't it?! The photo unfortunately doesn't show it in it's full glory... in real life, it looks amazing! I tried all sorts of lighting to show this to it's best, and this is the best I managed. I think you can see that it makes the nails look really pearly, and I think this is a lovely variation of 'Do You Lilac It' for summer wear. In the sunlight, the 'Rainbow' polish picks up every colour you can imagine, it's just so pretty! Do you have any recommendations for nail polishes to layer?.. I'd love to try more! OPI do some great purples. I have Grape Fit. Good layering! This is a lovely colour!! Very pretty and girlie :) It does remind me of pearls. There are so many possibilities with layering. the colour payoff is amazing for just one coat!